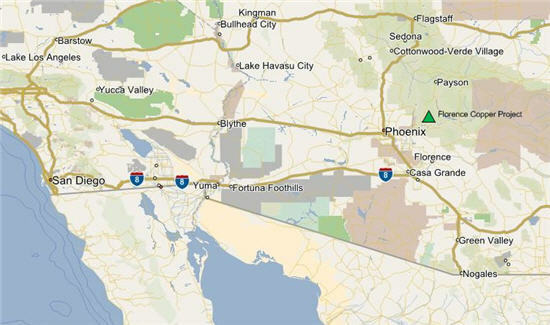 A positive prefeasibility study for Curis Resources' Florence copper project in central Arizona lifted the company's stock today. Curis Resources (TSE:CUV) jumped to a 52-week high on Wednesday reaching $1.29 during mid-day trading. Using a long-term copper price of US$2.75 per pound for its Florence copper project, the company forsees a pre-tax net present value of US$748 million at a 7.5% discount rate with an internal rate of return of 38% and a pre-tax 2.4-year payback of initial capital. Initial capital costs are estimated at US$196 million, 18% higher than a initial capital cost estimate from 2010. The commercial operating life of the project has also been extended from 19 to 25 years. 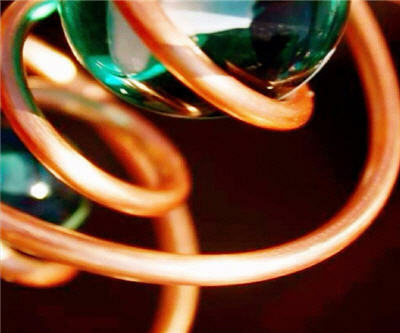 The average design production rate is estimated at 55 million pounds (27,500 tons) of copper per year in the first five years and rising to 85 million pounds (42,500 tons) in year six. The Florence copper project site hosts a shallowly buried porphyry copper deposit with a significant oxide mineral resource that is amenable to in-situ copper recovery and industry-standard solvent extraction and electrowinning (SX-EW) copper production. The prefeasibility study was carried out by M3 Engineering & Technology Corp.